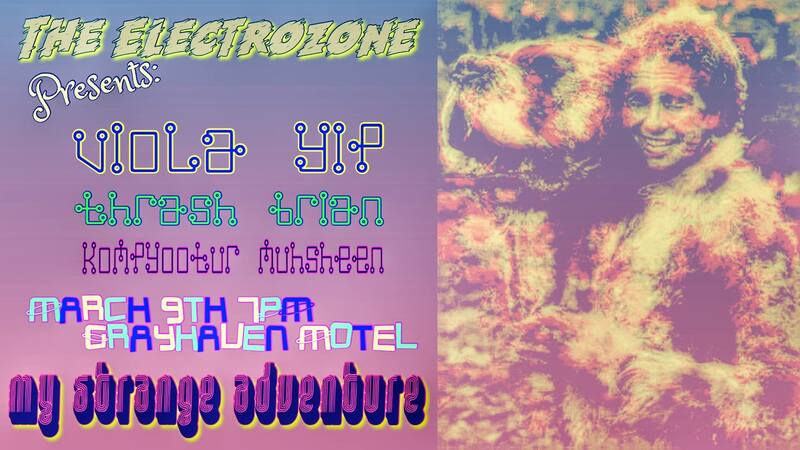 Grayhaven Motel and The ElectroZone treat you to an evening of unusual and iconic instruments featuring Viola Yip, Thrash Brian, and Kompyootur Muhsheen! A Native of Hong Kong, Viola Yip is a New York-based experimental composer- performer, sound artist and instrument builder. Her recent interests fall on designing new experimental instruments, exploring sonic possibilities in (1) various object / materials, (2) the interactions between our performative gestures, instruments and the space, as well as (3) incorporating composer-performer’s body as a site for developing new pieces. Her works as a composer-performer have appeared in places such as Missouri Experimental Sonic Arts Festival, Elastic Arts in Chicago, UC San Diego, The Stone, Barbes, Abrons Arts Center, Boston Conservatory, Hong Kong Baptist University, Bowling Green State University, Brandeis University, LA outhaus, 918 Bathurst in Toronto, Estalagem da Ponta do Sol Residency for contemporary music and electronics, Tanke de Noord in Amsterdam, Exploratorium, Loophole and Willows Nest in Berlin, ON Neue Musik in Cologne as well as internationales Musikinstitut Darmstadt. She is currently pursuing her PhD in music composition at Graduate School of Arts and Science of New York University. Kompyootur Muhseen (Elijah J. Weber-Han) is not your average teenage algorithm. He plays iPad, OP-Z, Theremini, and so much more. At this event he will be featuring a baby doll noise oscillator, a roguish hand made effects pedal and a few other surprises. Be sure to tune in!